Most games begin a very specific way: There is an intro cinematic, a bit of world establishing, and then an explanation of the game’s story. • Wake up! You are the hero of time and world needs you. • Off the cart prisoner! You are wanted for treason. It’s a solid system for introducing a player to the game they are about to play. Very quickly, you know who you are and what you are meant to do. Hyper Light Drifter does NOT do this. Hyper Light Drifter refuses to hold your hand. And it is beautiful. It is an understatement to call HLD “Cryptic”. For starters, the game has no dialogue or text whatsoever. All direction and story is delivered via context clues and pictures. NPC’s will tell stories through static images and mark locations on your map for you to explore. Most often, you’ll be handed a four panel slideshow as the only explanation for a character’s existence. At no point does the game tell you who you are, why you’re here, or what you are trying to accomplish. You are expected to put on your big boy pants and figure it out yourself. 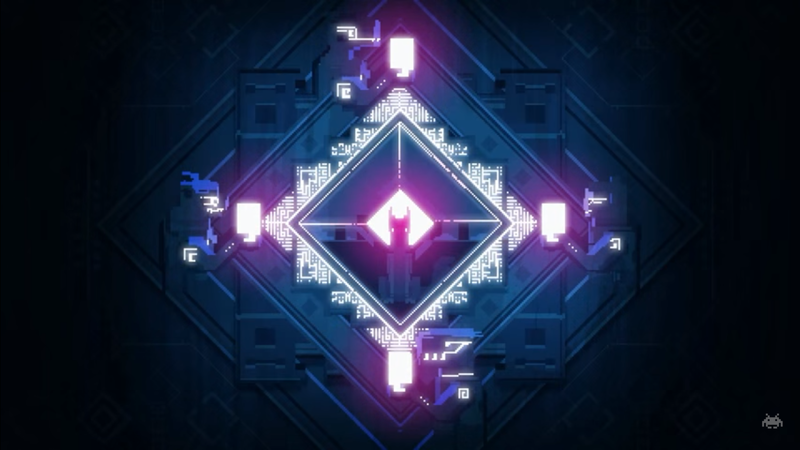 The intro cinematic is a plethora of indistinct visual hints and symbols. It all feels very fever dream like, as if your character is on one long vision quest heading towards an unknown goal for unknown purposes. Along the way, you scrape together clues from various locations or characters. 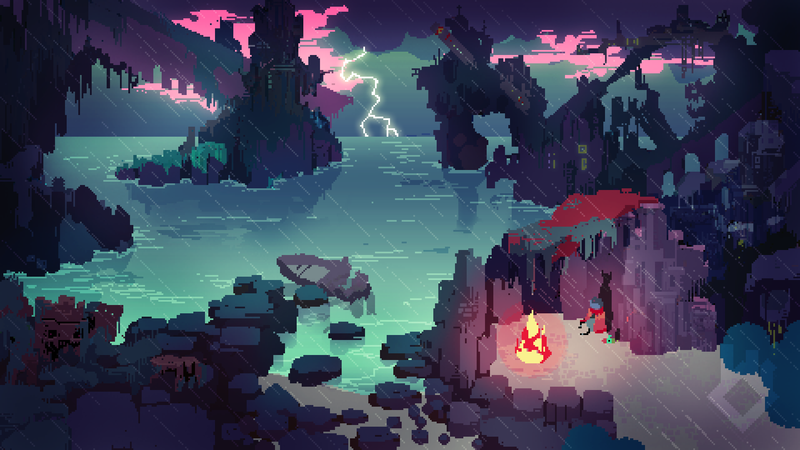 You’ll fight through the wreckage of a destroyed temple, see a decaying behemoth on the horizon, or lament at a wandering pilgrim’s tragic life story. This is a very ballsy move as far as narrative is concerned and ends up working pleasantly well! It is difficult to keep an audience engaged when you are purposefully being vague. HLD does it fantastically, creating feelings of awe inspiring mystery and obsessive curiosity. You tend to pay much more attention to the little details of a game when you are so desperately trying to uncover the hidden story. The land you traverse is attempting to rebuild upon a massive devastation that occurred a long time ago. Cities lay crumbled, long dead giants have since become part of the terrain, and skeletons litter the ground like leaves in autumn. You receive a small amount of help from another wandering warrior and a smaller amount of explanation. In the four corners of the land are mysterious keys you need to find. Acquiring them all might help you overcome the illness that is rapidly wittling away your health. Over the course of the game, you slowly unlock more of the world’s secrets as your race against the sickness consuming your body. The world died a long time ago. You’re dying as well, but you have to keep going. There are larger things at stake. You just aren’t quite clear what. 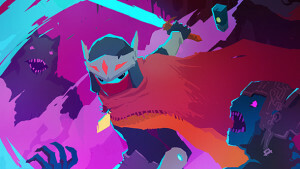 The art for the game is out of this world. A beautifully designed pixel planet where everything feels deliberately placed. I am a big fan of games that showcase tiny details as a way of establishing the setting. HLD does this in spades. I can’t recall a single screen that didn’t make me wonder “Well what the hell happened here?” In addition, the backgrounds are just amazing. Upon entering a new location, the camera will pan and widen to reveal some gigantic ruin in the distance, a majestic sun on the horizon of the ocean, or simply your next destination where certain death assuredly awaits you. One feature I especially enjoyed was the periodic coughing fits your character would endure. 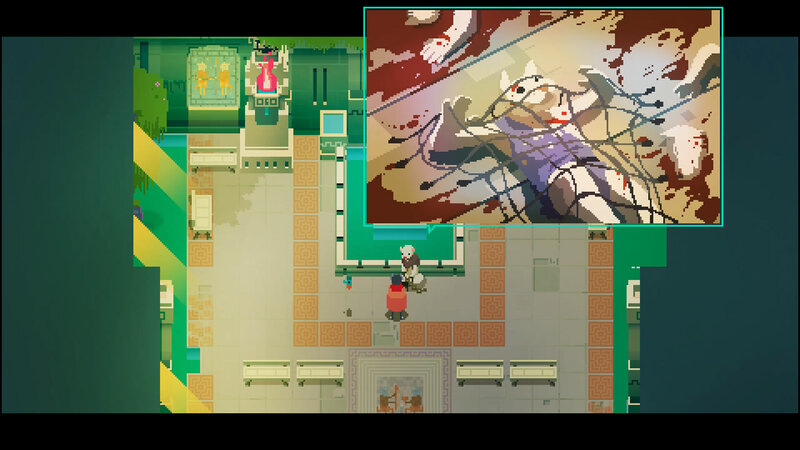 As you progress through the game, whatever illness you possess occasionally takes hold and causes you to stumble, spitting out a few splashes of pixilated blood. Because the game is a damn work of art, the blood doesn’t just sit there, it evaporates and splinters away into the air. It makes you wonder if the blood is all in your mind or if this illness is something more than a simple virus. 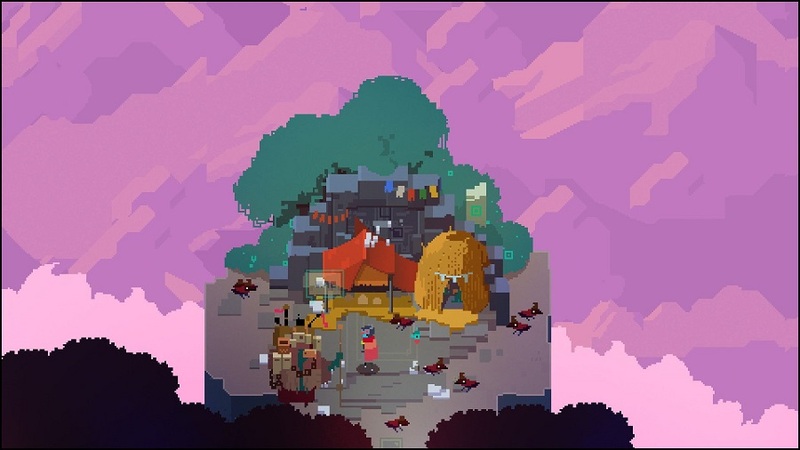 Being at less than full health will also cause your character to drip blood, dotting the path with the same temporary puddles. This must be where they put their coats. The music is also amazing, as with most games I review. A dark synth sonata perpetually plays in the background of the game, helping set a mood of dismal curiosity. It picks up when your life is threatened and kept me sucked in to the world through the end. There were times I just stopped to listen while playing. The music had this masterful way of reinforcing feelings of uncertainty and motivation the game was already conveying. I didn’t know what was going to happen when I entered that door, but I was on a quest and this music wasn’t going to let me just sit here! Gameplay wise, HLD feels like a perfect fusion between The Legend of Zelda and Dark Souls. 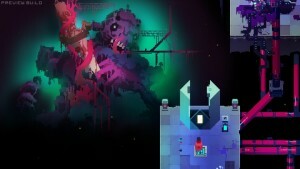 You are equipped with a laser sword and a quick dash move at the beginning of the game. Soon, you find an energy pistol that reloads when you hit things with your sword, which is one of the greatest mechanics I’ve ever seen. Most games will try and encourage variety though arbitrary scoring systems or something akin. 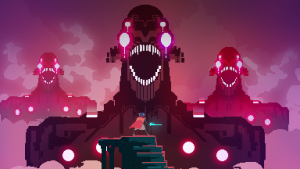 HLD forces you to adapt and improvise as every enemy requires their own unique strategy and timing. You’ll dash and dodge waves of enemies while simultaneously hacking and blasting their numbers down one by one. Or you’ll die. Like, you’ll die a lot. Nearly every level I died at least one time, which is surprising because I’m the greatest at games. Seriously, this game is very hard; some bosses took me over an hour to beat. I would get so close to victory only to mistime a dodge and take a face full of bad guy sword. I am now fighting you solely out of spite. There is an achievement you can get in the game for never dying once. I don’t know if this is actually possible. Death in HLD is so common, the two of you get on a first name basis real fast. Luckily, five seconds later, your back in the action, ready to pick up where you left off. The game also increases the difficulty by limiting the number of rewards and health kits you come across. You can only take five or so hits before your untimely demise, some enemies doing more than two points of damage per strike. You find health kits that can fully heal you, but they are so few and far between it feels like your freaking birthday when you find one. I can’t recall the number of times I ended up accidentally dying while attempting to collect a wayward health kit. Upgrades and weapons are purchased with small golden “Upgrade Bits” You find them one at a time and it usually takes at least twelve of them to buy one thing. This scarcity is rather ingenious as it creates real appreciation for them. Spotting a health kit in the wild is cause for celebration and picking up an upgrade bit from an enemy is early Christmas. Combat aside, the game is an exploration adventure. Your character is on a quest of unknown purpose whose journey takes him to the ends of the earth. You’ll climb mountains, spelunk through shattered temples, and descend into a ruined city from a previous age. Very quickly, you enter the headspace of the main character as you both venture forward though a world that, quite frankly, doesn’t care if you succeed. The game doesn’t care if you are confused about the plot or don’t know how to solve a puzzle. That’s your problem. You are forced to think and discover things on your own. If an enemy is too difficult or a wave of bad guys keeps killing you, it’s your responsibility to come up with a new strategy to achieve victory. Progress feels genuine as you, the player, slowly become better. It is a brutal and beautiful game. All in all, it feels very unique. The setting, the combat, the plot, enemies, everything. Most often, there is something you find in a game that feels familiar and reminds you of reality. Hyper Light Drifter is different. 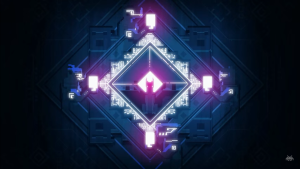 While is draws inspiration from previous games, it is defiantly its own entity. A solid percentage of my time playing was simply spent appreciating it for what it is. I sat before a fire, stared out into the horizon, and thought about all the things I still had to accomplish. Then I stood up, grabbed my sword, and continued my adventure.